Goldenfeast Australian Blend - 10 lbs. is for small birds. 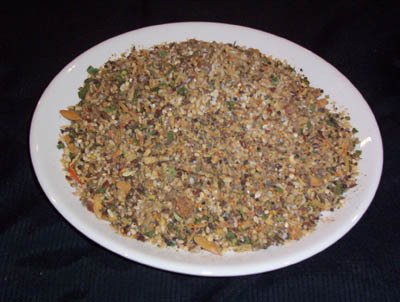 Ingredients: Toasted soy grits, whole sesame seed, dehydrated granulated carrots, steel-cut sunflower kernels, white proso millet, dehydrated granulated broccoli, canary grass seed, canola seed, flax seed, bentonite crumbles, steel-cut hulled oats, Japanese millet, small golden (German) millet, poppy seed, cooked dehydrated granulated beans, niger seed, red Siberian millet, canteloupe seed, sterile hemp seed, ground star anise seed, granulated dehydrated apples, lettuce seed, dehydrated granulated cranberries, freeze dried honey, freeze dried molasses, dehydrated pineapple, dehydrated papaya, fennel seed, cranberry seeds, Indian anise seed, dehydrated granulated cranberry skins, dehydrated whole egg solids, bee pollen, dehydrated paprika, dehydrated orange peel granules, dehydrated chives, dehydrated spinach, dehydrated parsley, dehydrated garden peas, dehydrated chamomile flowers, dehydrated spirulina (fresh water algae), granulated dehydrated sea kelp, caraway seed, dehydrated whey, Dried Lactobacillus acidophilis fermentation product, Dried Lactobacillus casei fermentation product, Dried Lactobacillus fermentum fermentation product, Dried Enterococcus faecium fermentation product, and Dried Bifidobacterium longum fermentation product, vitamin-C (as ascorbic acid usp-fcc) and vitamin E (as di-alpha tocopheryl acetate usp-fcc), and natural flavoring.